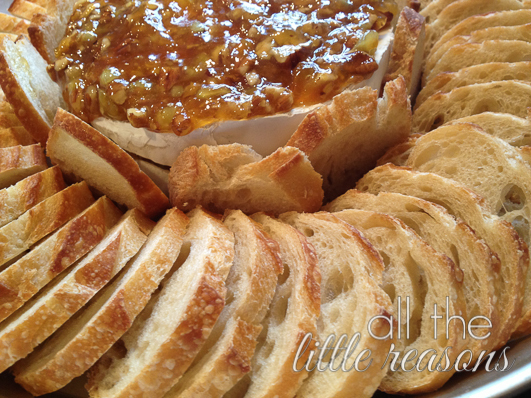 I was at a friend’s home years ago and she was SO excited about making this brie for me. She told me it had jalapeño, nuts, apricot preserves and brie. I didn’t want to hurt her feelings, but it sounded disgusting to me! I tried to gently prepare her for the fact that I was probably not going to like it. In fact, I’d probably think it was way too spicy and spit it out. Boy, was I way off! Not only is this one of my favorite appetizers, it’s one of those things I make for parties that just blows people away. It’s super easy to make, but it seems fancy. The flavors are spicy and sweet, crunchy and creamy…It’s gonna knock your socks off! As I come into the holidays, I always pull this recipe out to take for fancy dinners, or wine and cheese parties. It’s super easy to transport, especially if you can have it ready to go and pop it into the hostess’s oven for 10 minutes. So here it is. I am going to give you the measurements that the recipe uses on the Pampered Chef site. However, I do not measure this. I put a couple scoops of preserves, some jalepeno, some chopped pecans or walnuts or whatever I have on hand. It’s perfect every time. I hope you love it as much as we do!